Following up on last night’s post, I am pleased to present this photo update! This photo update features last-night’s quote: “Learning to draw, before you paint, is like learning to walk before you run.” (Don Getz) After coffee this morning, John and Mary McDonald and I took a hop and a skip and jumped right into a great painting session! After most of the black lines were painted, the true fun began! Like a swan in water, Ms. Mary made those pigments sing! Mary took a short break, and John focused on his work! Little by little, the painting came to life! Stopping point for the day! John and Mary focused on color, while I worked on black lines. They will resume work on the painting after they journey home tomorrow. I look forward to seeing their finished work, one that will forever remind them of their Timeout in Canoa Ecuador! It’s brilliant! I love the shapes! thank you so much! i’m glad you enjoyed following the progress! This takes a much steadier hand than I will ever have! Great work. This is definitely a far cry from where my head space was! That is so beautiful. I love the social aspect of the project. I’m sure it gives it a life of its own. I don’t think I mentioned to you, but I come from a family of artists– painters, in particular! ‘all things are difficult before they are easy.’ even sketching! Love the collaboration and Lizard ! Z, I love the way you involve others in projects as you share not just your talent, but your love for art and people and your enthusiasm. Whenever you get to Panama and happen to go SSW from PC to Pedasi, please do stop by and we will have a room for you. I started one of the first digital sign companies in Silicon Valley in the mid 80’s. Have owned a fine crafts gallery, managed 2 other art galleries and design type faces for fun. Working on starting a Fair Trade crafts company that will repurpose tourist oriented crafts into more salable retail items to export back into the U.S. Boutique marketplace. In addition to paying a fair wage the profits will be used to develop craft co-ops that give work to widows, disabled and others in need. I would love to draw and paint with you as I have always done things differently and your style is truly fun and a “bit” different. Keep on, keeping on. that sounds like a great suggestion! my next trip back i would like to visit the san blas islands and spend some time with the kunas, and i would love to visit pedasi – i’ve never been to that area. thank you so much for the invitation; your projects sound very interesting and i look forward to learning more! A wonderful and treasured souvenir of a great time together. That is a good one. Different. Like it too. I am amazed how productive you, and your friends, are. This is awesome! Again, I am sooo jealous. I have a few questions. Do you use just regular plaster board for the paintings? Do you prepare it in any way before you start applying the paint? After the painting is completed, do you cover it with anything to protect it? Our supplies are very limited in Nicaragua, so I have to make do with what we have. For my huge 15 ft. mural in my kitchen, Ron made the wood frame, then we stretched heavy beige canvas over the frame. We prepared the canvas with a wash of white acrylic paint that dried and stretched the canvas tightly over the frame. It was so time consuming. I have an idea for a large painting in my Tortuga guest house and it would be easy to use plaster board. So great to see everyone get right in there and have a hand in the painting. Love the design and “Harmony” of painting together. Great pictures – they’ll always remember the special time they’ve spent with you. Don’t remember many pinks, if any, in other post pix. I like that a lot! It pops amid the blues and greens. Fab work, you all. 😉 Fun! how great, amiga! great new gravatar! how’s life, oh talented one? the weather here has been cool, and most people are wearing long sleeves in the daytime and jackets at night! that’s so strange for sea-level living on the equator, but so typical in the dry season and such a contrast to the high temps in the states. What a fun piece to work on and one John & Mary will always associate with birthdays and anniversary. You have a system …like you say…start with the drawing/design, define the edges with black and then the rest with beautiful colors. I love how your studios are set up anywhere and everywhere. What a lovely setting this was…plein air. the courtyard was very serene and quiet, and we enjoyed the painting session as well as relaxed conversations! The painting made it home safely on the bus, though we did get a lot of curious looks since the painting was turned to the inside for more protection and only tiny bits of color was peeking out. As we were getting on the bus in Bahia a gringa asked John “aren’t you the person who was in Canoa with Lisa , painting?” She follows your blog and recognized John from a photo. Ecuador keeps getting smaller. Had to keep moving towards our seat so didn’t get a lot of time to chat..her name may have been Cindy /Cynthia (?) And guess what the sun is shining here in SC !! woohoo! oh my! yes, cynthia lives in jama and was leaving this morning for cuenca! she is a LOVELY person and owns about 7 hectares in the country near jama! that sounds just like her! how lovely! 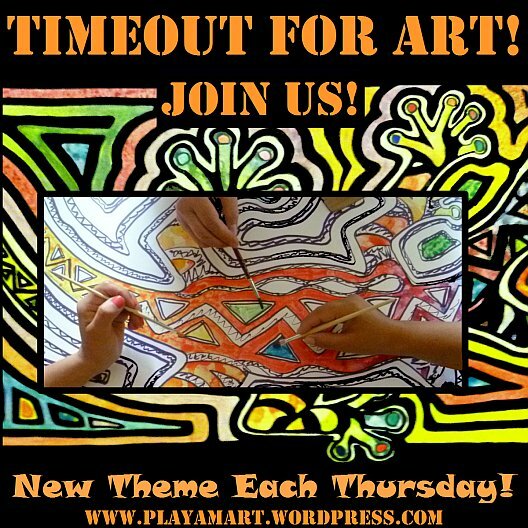 Part two of time out for art in Canoa ! thank you, jose! john and mary did very well! That is awesome!! You all are getting really good with that art time!!! Yes, with practice we do get better! Thanks so much, Susan! thanks so much! i’m sure john and mary will post when the painting is finished. i’ll pass it along! One of the aspects I particularly enjoy about your projects is the encouragement and confidence you give to those who question their own artistic ability. I am sure they leave you feeling 10 feet tall and grateful for the experience you have provided. I am sure the sense of achievement for them (and for you) is immensely rewarding. there’s a very unique feeling that goes with that, and it’s hard to articulate. i would put it close to a serene feeling of peace. of maturity, that life is not about ‘first person’ but about everyone else. Absolutely stunning, Lisa. you all did a great job. 🙂 What fun! yes, we had a lot of fun, and it was also rewarding to watch john gain more confidence with each stroke of the brush!